Dedicated to improving healthcare through technological advancement to integrate research and technology with clinical practice. five profiles were found for Centerstoneresearch.org in social networks. Among other social networks the website is represented in Facebook, Twitter, GooglePlus and LinkedIn. The web server used by Centerstoneresearch.org is located in Brentwood, USA and is run by Peak 10. The server runs exclusively the website Centerstoneresearch.org. 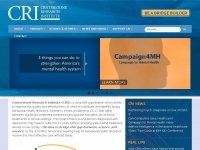 The Centerstoneresearch.org websites were developed using the programming language PHP and served by a Apache server. For managing the data of the webpages the CMS WordPress is used. XHTML 1.0 Transitional is used as markup language on the webpages. To analyze the visitors, the websites uses the analysis software Google Analytics. The website prohibits search engines and webcrawlers using the description of the website from the Open Directory project. Other actions by webcrawlers and bots are allowed.